This has been a weekend of some serious hard work. After an early start on Saturday, Dom had the window sill (which was sagging in one corner) and the entire kitchen(!) gutted by lunch time. Check out the dust! As is typical with this house, we find one problem hides another. In this case, not only had the window sill been entirely unsupported but when we pulled it out we discovered that the breeze blocks that make up our house wall could be pushed out with one finger, so Dom would have to rebuild it. At 2pm we had a kitchen design appointment. I won't say which shop we went to, because we weren't overly impressed and we do still want the kitchen, but it looks like we'll have to utilise Dom's carpentry skills if we want it to fit the space we have available. After this I managed a quick sprint round some shops to check out what bridesmaid dresses were on offer, then we were back early evening to clean up the huge amounts of dust. I cooked dinner and we watched a smidgen of TV, and whilst Dom, like a machine, went back to work on the kitchen electrics, I ashamedly fell asleep on the sofa at about 9.30pm. This morning we woke early again: Dom continued with the kitchen electrics and I packed away my law books in the loft, feeling that it was safe to do so having passed some big exams on Friday (hurray!). I then packed the car full of the ripped out kitchen units and tiles for us to take to the tip. We followed this with a trip to B&Q to buy plasterboard, strong glue and expanding foam and were back for about 1.30pm. Dom reconstructed the wall under the window in the living room, then proceeded to replace the plasterboard in the kitchen where the tiles had been ripped out. My role during all this was one of labourer, passing screws, sawing batons for attaching plasterboard, cleaning around Dom as he worked etc. When I had some free time I planted up the garden, cut up some disused fence panels ready for the tip, did the weekly shop and painted the length of the new fence we put in a few weeks ago with our new Cuprinol fence sprayer. It was amazing! Very quick, but although I tried to be careful I still managed to get spots of paint on our new neighbours' white sheets as they hung on the washing line. Oops! It's nearly midnight now and Dom is still working away on the kitchen walls! 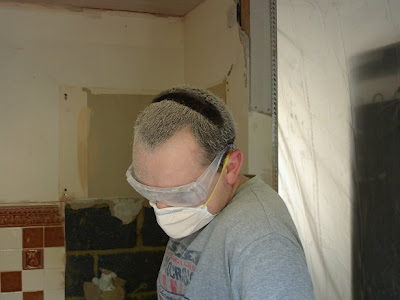 I forgot to mention the reason why we are doing all of this - the plasterer. He has spent three days here and is coming tomorrow morning for his next three and everything has to be ready. Every muscle in our bodies is aching but, as the saying goes - no pain no gain! The main reason that I haven't posted for a while is that we have been on a week's holiday in Scotland. We camped with some friends for three nights in Glendaruel. We couldn't have asked for better weather for the time of year: blue skies and sun meant that we could sit out in our fold away chairs, play football-rounders, and enjoy long walks to work up a thirst for a beer or two. This did not stop the nights being cold cold cold. Even with all the gear (blow up mattresses etc) I got barely any sleep on the first night, but wrapped up to excess on nights two and three and all was well. 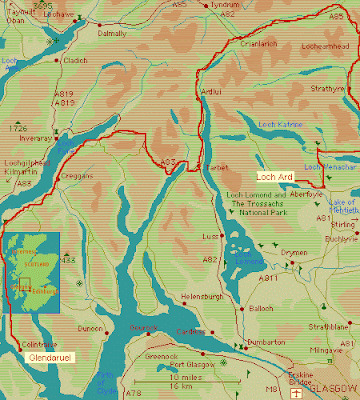 Our friends drove home, but we drove on, around the tip of Loch Lomond and into "the heart of Scotland" - the Trossachs. The landscape we drove through was absolutely breathtaking. 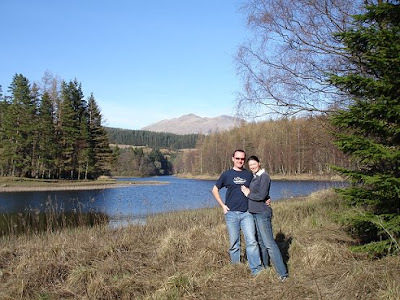 I didn't realise that such beautiful scenery was practically on our doorstep: snow topped mountains, thick pine forests and beautiful lochs reflecting the blue sky. We stayed three nights at the Forest Hills Hotel, near Aberfoyle, which was fantastic. A real luxury after the camping. We had the best room in the hotel, with four poster bed and views straight out onto Loch Ard. The food was great too. We'll definitely be spending more time exploring the country. If you're living in Britain and you haven't been - go!